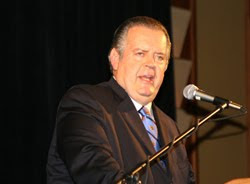 By JAMES A SMITH SR.
GOD AND COUNTRY Richard Land, president of the Southern Baptist Ethics & Religious Liberty Commission, speaks Sept. 26 in Orlando at the 20th anniversary “God and Country Banquet” of the Christian Coalition of Florida. Photo by James A. Smith Sr.
ORLANDO (FBW)—President Barack Obama and Democratic leaders of Congress are advocating healthcare reform that will result in rationing of care, making them guilty of the same ideology that fueled the Nazi Holocaust, Richard Land told the Christian Coalition of Florida at a Sept. 26 banquet in Orlando. Land was the keynote speaker for the 20th anniversary “God and Country Banquet” of the Christian Coalition of Florida. “Let’s remember,” Land added, “the first 10,000 victims of the Holocaust were not Jews, they were mentally handicapped German children who were gassed and burned in ovens because they were considered to have … lives unworthy of life,” citing the Nazi ideology used to rationalize the Holocaust. At stake in the healthcare debate “is the definition of a human being,” he said. Land said he has bestowed on Ezekiel Emanuel, the president’s chief healthcare advisor, the “Dr. Josef Mengele Award” for his advocacy of healthcare rationing. Mengele was the German SS officer and medical doctor dubbed the “Angel of Death” for his role in the Holocaust. Land said Emanuel, a medical doctor and bioethicist who is also the brother of White House Chief of Staff Rahm Emanuel, has published articles arguing the maximum access to healthcare should be for persons aged 15-40. “After 40, you lose your right to access healthcare with every passing year,” Land said of Emanuel’s views, comparing them with the British healthcare system. Land said patients in Great Britain face much higher mortality rates than patients with the same diseases in the U.S.: breast cancer, 80 percent; colon cancer, 40 percent; and prostate cancer, 604 percent higher chance of dying in Britain compared to the U.S.
“There is loose within the liberal culture which dominates the Democratic Party and dominates our government at present, a biological bigotry that is feeding a euthanasia mentality,” Land asserted, citing several examples. A Veteran’s Administration document dubbed the “death book,” originally issued under President Bill Clinton and re-issued under Obama, is a “pro-euthanasia tract,” according to Land. Land said an early version of the House of Representatives healthcare reform bill, HR 3200, and a different bill sponsored by Sen. Max Baucus, D-Mont., contain provisions for “death counseling” to train doctors how they can advise their patients concerning end of life matters. It isn't true that people over 59 and a half have no right to dialysis on the NHS, that's utter cobblers. The NHS treats people for cancer, if they have cancer. It's quite easy in the USA and Germany, if you have money or good insurance, to find yourself being treated for something you don't actually have, but which is pretty lucrative. Some hospitals charge $5,000 for a scan that's $1,500 elsewhere (and would probably cost the NHS no more than £200, if that!) They can charge thousands and thousands for radiotherapy, and for anti-cancer drugs. Medawar humbly contends that the higher success rates for cancer treatment in the USA and Germany is primarily because there's a lot of wilful mis-diagnosis and a lot of the surviving patients never had the disease in the first place. The NHS is very systematic about diagnosis, and no-one personally gets more money for diagnosing something that you don't have. Therefore, the NHS survival rates for cancer probably reflect the true effectiveness of the treatments, rather than any rosier image created by treating a proportion of healthy people. This is because no-one asks any dumb questions about funding or treatment costs before treating the injured, or shot, patient. And this SAVES money, because trauma outcomes -and the length of stay in expensive high dependency beds- are invariably improved by getting on with the job in the first few minutes! There's also a huge benefit in trauma cases, by a nationwide organization sharing information about best practice, and there's also a much greater willingness on the part of hospitals to transfer patients to better facilities or surgeons elsewhere, as this isn't seen as "loss of trade." Where the NHS wastes money, is in employing extra layers of management created largely to employ Blair supporters and inject political control. This isn't a necessary feature of the NHS, and dates no further back than the election of Tony B.Liar. There's about 80,000 Blair stooges in public service who could be sacked tomorrow -and public services would actually improve, because all they do is get in the way of the people actually doing the work. Thanks Medawar That is enlightening!